Thandai recipe, is a cold drink prepared with a mixture of almonds, fennel seeds, watermelon seeds, rose petals, pepper, vetiver seeds, cardamom, saffron, milk and sugar. 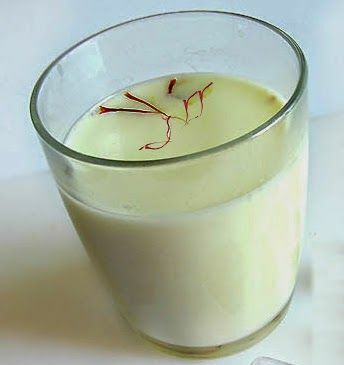 Thandai is very useful to be fresh and cool in summer. In India, this is very popular drink and many healthy benefits of this recipe. Therefore we are discussing to prepare this drink at home. First we should collect all the ingredients are mentioned here. Ingredients: - These ingredients are used for 10 glass of thandai. Two (2) liter pure and fat milk. One (1) tea cup powdered sugar or you can add as needed. Fifteen (15) numbers of black peppercorns (Kalimirch). A few amount of saffron (Kesar). These ingredients are used to make a paste. First you should collect these ingredients and soaked into water for at least 2 hour. After 2 hour, take them out from water and make a paste by grinding with grinder or by any way. Half (1/2) cup of Almonds (Badam). Four (4) teaspoon of Poppy or Vetiver Seeds (Khus-Khus). If doesn’t available then add 30 to 35 Rose Petals. Four (4) teaspoon of Fennel Seeds (Saunf). One (1) teaspoon Cardamom (Elaichi) powder. One (1) teaspoon of Watermelon Seeds. Twenty (20) numbers of White Peppercorns. Take this paste and follows the method to preparing it. Boil the milk and keep aside until it becomes cool. Thereafter add this Thandai Paste into the milk; also add sugar and peppercorns into it and mix properly. Filtering this mixture by sieve and keep this mixture to cool in Refrigerator for half an hour. Or insert some ice pieces into glass. Serve this chilled and cool recipe. Thandai is not only a refreshing drink but also it gives many healthy benefits. In summer it is similar to the nectar. Therefore, make it and get ready to drink. 1. Energizer: - It gives energy and it’s a refreshment drink for our body and mind. 2. Boosting the immune power: - It’s works as immune booster. The Fennel seeds have antioxidants, anti-flatulence, cooling property and Almonds are gives vitamin E & are known for their antioxidant effects. 3. Saffron: - This is the excellent spice or herb that prevents from arthritis, cancer and improves vision. It’s also useful into medicines as antiseptic, antidepressant, anti-oxidant, digestive. 4. Milk: - It contains calcium, protein and vitamin C. This is the complete booster for our body and makes your body strong and healthy. Also it makes strengthen our bones and teeth. 5. Watermelon seeds: - Watermelon seeds are the best sources of energy, protein, iron and vitamins. It cools the body and makes strengthen our muscles and bones. 6. Rose petals: - This is very useful to cure digestion problems, irregular periods and stomach diseases. It is also useful in insomnia and nervous weakness.